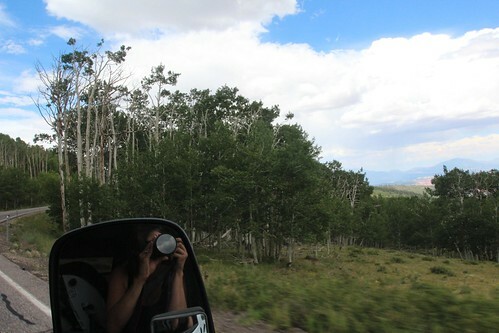 Mali Mish - Day 7: Climbing the Summit through Utah's Scenic Byway 12. But since today is a transit day, we can’t just let these sleepy heads lay around forever. We’ve got to get moving. 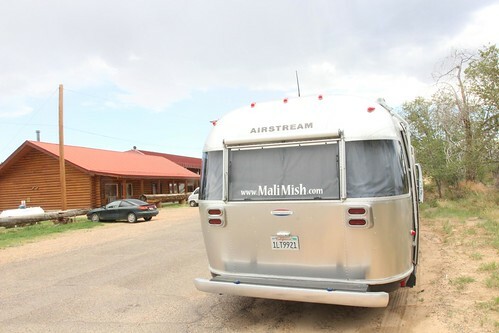 As we got the Airstream prepped and hitched up, the girls and Luka went to settle the bill with the owner Mark at the front office. He lets you keep an open tab at the drive-in’s snack bar so you can really go nuts with all of the goodies. We managed to maintain some self control and stuck to just pop corn. 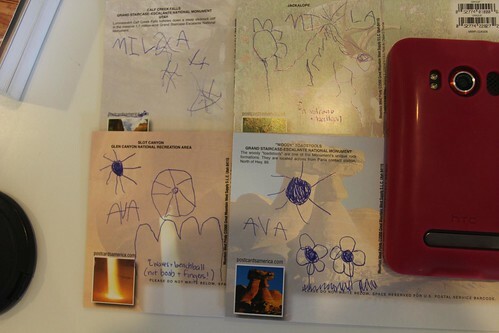 We also got a second round of post cards for the girls to send out to their favorite people. Keep an eye out for that mail man! 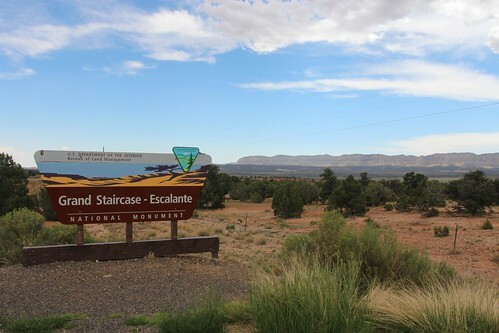 As we drove away from The Shooting Star, we stopped one last time in Escalante to have lunch at the Prospector Inn. It is a restaurant inside a real log cabin and they claim to have the biggest portion in town. I will just take their word for it. While we were in the retaurant, a storm cloud came from the west and dropped a ton of rain on the ground. 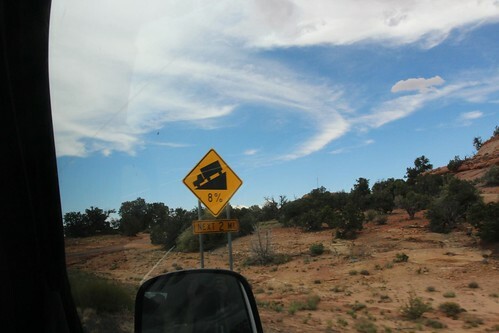 As we headed further east and eventually north via Utah Route 12, we were pretty much chasing it. We had about a 70 mile drive today on what is called the Scenic Byway 12 of Utah. It is so far the most amazing route we have been on during this trip. That is saying a lot in these short 7 days because we have been awed by the landscape ever since we left Cedar City. For most of the drive we are meandering along the Escalante river. 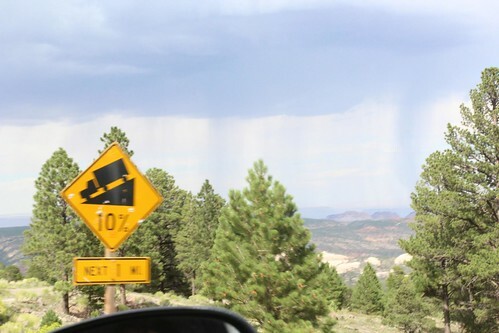 The altitude is constantly changing and in some of the areas, we are navigating hills both up and down up for several miles at a time and upwards of a 10% grade. Marlene is not a fan of mountain roads, this did not make her very excited. We made several stops just to let out brakes cool off during some of the bigger downhill grades. As they warm up, they start to chatter a bit due to the heat. There are dozens of scenic lookout points throughout byway 12 so we took advantage of these breaks and soaked up the views. They are absolutely stunning. One thing I forgot to mention to Marlene this morning while we were still at Shooting Star is a little peculiar thing that happened to me while I was emptying the tanks. I had sent everyone else off to the front office to talk to Mark as I stayed back to finish getting ready. As you might know, Mila has been seeing ghosts in this field the last couple nights and we suspect they are Native American spirits. While I was alone driving to the sewer dump, I felt a drop of liquid fall on my hand. When I looked down, it looked like a fresh drop of blood. I immediately checked in the mirror to see if maybe I had gotten a bloody nose. I looked all around my face and head to see where that drop could have come from but I did not have blood of any kind dripping from me whatsoever. When I finally told Marlene about it, she was visibly spooked by my encounter. She did not first believe me and thought I was just messing with her. 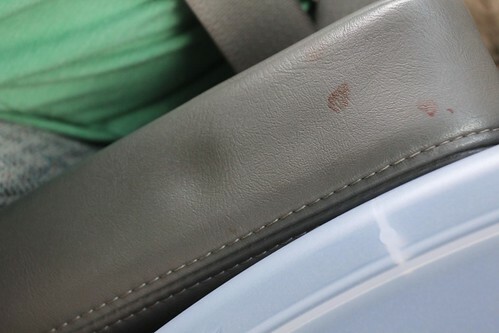 I assured her that it was not a joke and while we were driving, she notice a couple more drops of blood that had dried on my arm rest. I still don’t know where those drops came from but we think there is definitely something going on at the RV campground of the Shooting Star Drive-In. We asked Mark just before we left if he had any knowledge of spirits in the area. He told us that a few years ago, in the white mountains near Escalante, Brigham Young University had conducted an archaeological dig and discovered what they believed to be the remains of an Anasazi chief. The team relocated the bones from the burial grounds and ever since then, many people have been reporting unusual paranormal activity in the area. They are suppose to be bring the remains back for a proper burial and hopefully that will bring some peace to the spirits. OK, back to our drive towards Torrey, Utah. The terrain really changes around here depending on the elevation. We can tell pretty much how high we are just be seeing what is around us. The high desert brush tells us we are around 5-6,000 ft and the Ponderosa Pines let’s us know we are approaching 8,000. During one of the biggest climbs of the day, we lost sight of all of the pine forest and saw nothing by large patches of birch. We had not seen them in the last 6 days of driving through the mountains of Utah so we knew we were seeing a whole new ecology at a new elevation. We got to the summit of our mountain during today’s climb and it peaked at 9,600 ft. It is the highest we have ever been with the Mish. It isn’t surprising since Marlene is not a big fan of mountain driving. She cannot wait until we get to flatter and straighter roads but I am savoring these moments while I can. The climbs have posed a pretty good challenge for the van as well. During the steepest part of the climb up to the 9,000 ft range, the engine temperature reached an uncomfortable level for me. For the first time, we cranked up the heater in order to help it cool down. Evetually, we pulled over at another scenic turnout to let the engine settle back down to normal temperatures before continuing. It was just another opportunity to soak in the amazing views from atop these mountain ranges. Soon we will also need to get our brakes inspected when we get into a bigger town to see what kind of wear we have put them through in these few days of mountain driving. 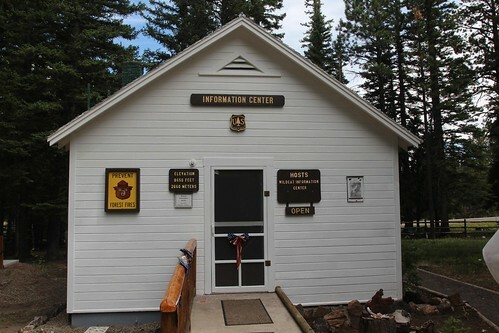 Before we started the descent down towards Capitol Reef National Park, we made one last high altitude stop to check out this visitor’s information center. 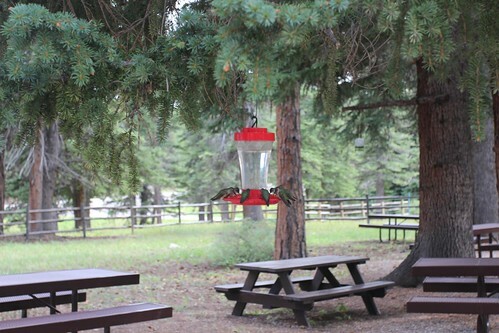 There are dozens of native hummingbirds feeding at the feeders that were left out by the nice older retied couple from Ohio who are volunteering here. 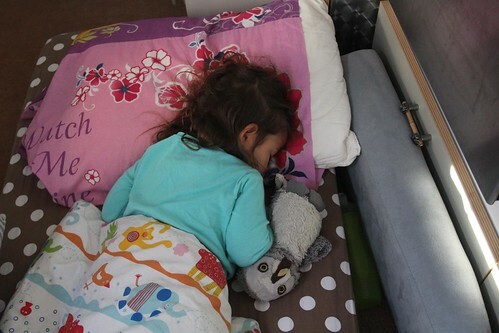 They travel the country a few months a year in a little 16-foot Scamp trailer. 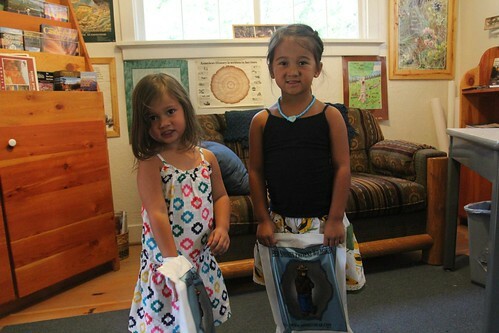 We spent a good half hour just chatting with them about both of our travels and they set the girls up with some Smoky the Bear goody bags and some very helpful tips for our travels in this area. You can see a good part of our conversation in today’s video but I must warn you, it is a little shaky since I was trying to talk, hold Luka and record a video at the same time. If you are prone to motion sickness, this is the time to pop a Dramamine. 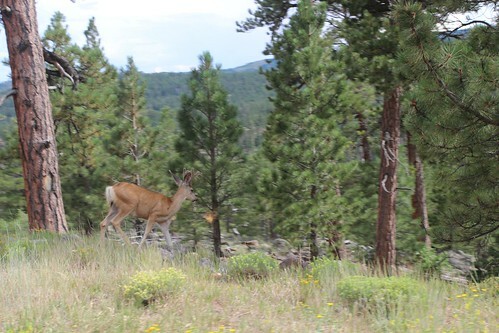 Here is one of the young bucks that roam around the visitor center. We were lucky to get a glimpse of him as we were driving away. Shortly after we left, we began a series of steep downhill grades that had Marlene clenching her teeth and holding on for dear life. We eventually made it down to about 6,000 ft in the town of Torrey, Utah. 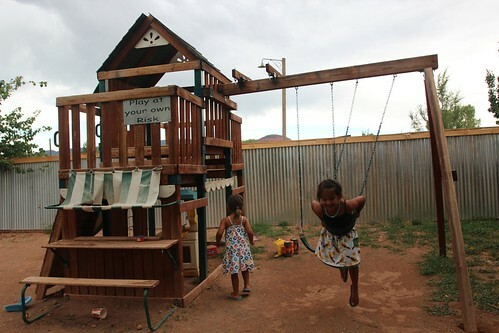 Its a small town of just over 100 people a few miles west of Capitol Reef National Park. 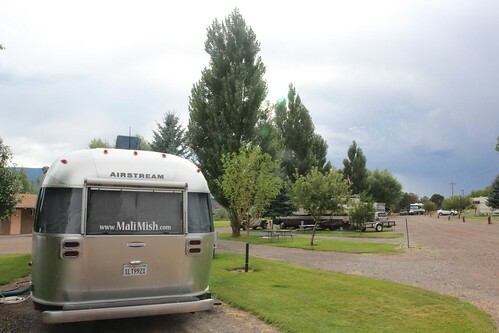 We pulled into a nice and clean RV Park called Wonderland RV Park. For $24 a night with a Good Same Club discount, we got a nice pull through site for the night and a decent wifi connection. George, the visitor center volunteer had told us about a burger joint he had heard good things about in Torrey. As a fan of good burgers, we wasted no time to check them out. Marlene is once again trying to introduce bread into her diet due to Luka’s gluten allergy. We are hoping he has outgrown it a bit as she ordered a hamburger for the first time in awhile. 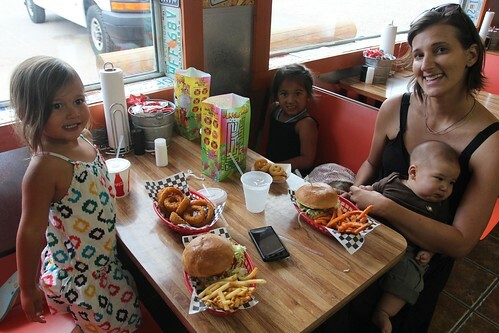 The burgers were good and the onion rings we great. I guess I am partial to my local favorites still and these still don’t quite measure up. Some of their prices are little disproportional as a burger and fries combo only cost $5.99 while a basket onion rings that consists of just 8 or so pieces cost a whopping $4.99. The girls had no complaints though about the ice cream. 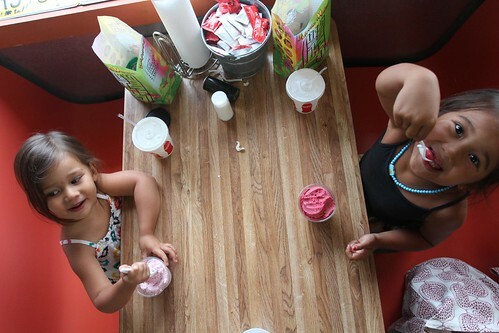 Mila got strawberry and Ava got raspberry sorbet. Interestingly, they are both pink. I wonder how that happened. 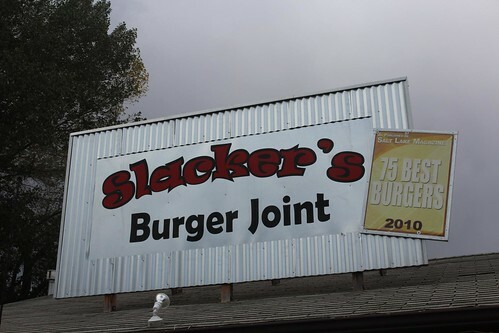 Slackers burger joint also has a small playground right outside with picnic tables. The girls were thrilled since our last few nights we have been pretty much been staying in a desert with electricity and water. 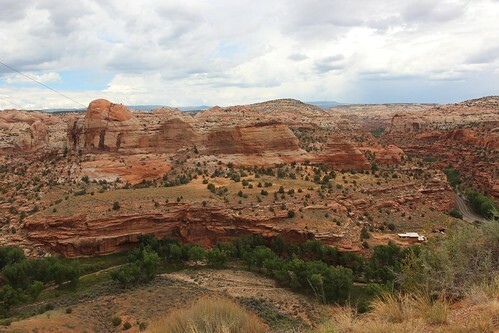 Tomorrow we will head into Capitol Reef National Park just a few miles east of us. We will soon be on I-70 heading towards Colorado after these last few miles through some of Utah’s most beautiful regions. 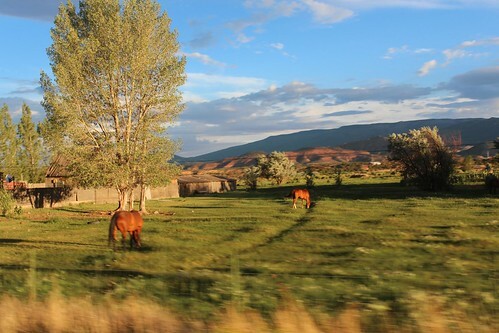 9 Responses to Day 7: Climbing the Summit through Utah’s Scenic Byway 12. Really enjoying your Blog! We were just through there this past June… it was outstanding! I see you’ve got a crumbsnatcher with gluten allergies; we’ve got a few in our fam. I’m gonna make a page for GF stuff… maybe get my DW to post her phenom recipes! PS. Sounds like your Chevy was struggling with the altitude, as well… it definitely put our 8.1L Suburban through its paces. Holy cow, I just got goosebumps . . .
PS I LOVED the video btw !! I just started following your blog, and I love it! We live in Salt Lake, and have never been to some of these places. It’s time to plan a trip! Again, we had your route! 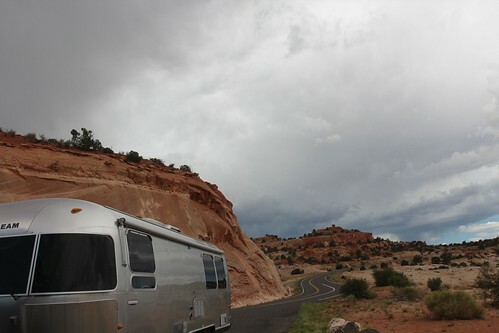 We also stayed at the same RV Park just outside of Capitol Reef. You must drive down the canyon rods in the park. They are spectacular, and van safe. Both areas are on the left as you drive toward the end of the park driving in. Enjoy! I was ready to put shooting star on my places to take a road trip, but after you’re encounter Dan I think I will pass. I’m a firm believer and would definitely have a stroke if that happened to me. I think Ill wait for them to put the cheif back. Man it must be torture for Marlene with all the great eating places you guys are stopping by. She sure has will power. Do you guys have the trip all planned out or do you research the places you stay while you are staying at the others? Are you guys going to visit Mt. Rushmore? @joe thanks! This is a beautiful area for sure. Marlene would be thrilled to try some of your recipes! @erin thanks for reading our blog and you definitely should plan a trip here before it starts to snow in a couple months! @peggy we are now staying inside Capitol Reef National Park. The drive there is definitely stunning! I managed to clear my work schedule for a couple days since there are no reception of any kind there! @charlene you guys will be fine. 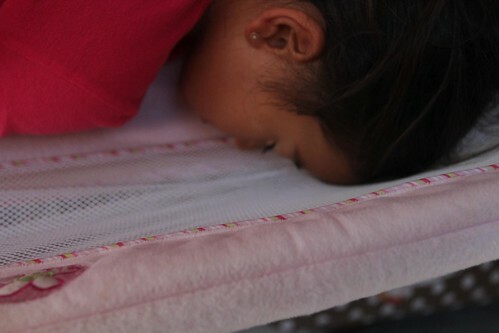 The pink underwear guys don’t mean any harm and your kids are probably too old to see them anymore like Ava. @gayle we will definitely check it out!